Are We Right for Your Project? At CRD, we are committed to tailored client care. We consider it a privilege to meet the unique needs of each person and family we work with. Please read below to determine if we might be a good fit for your project. Do we provide the services you are seeking? We do tackle full-service remodels, which usually include an array of trades services, such as electrical, plumbing, painting, etc. We don't provide standalone trades services that aren't part of a larger remodel. We also don't build projects designed by another firm. And we do not do new home construction or work in condominiums. As a full-service residential design-build remodeling company, we are organized and staffed to tackle larger projects and do it extremely well. We are not a good fit for installation services, repairs, or small "face lifts" a la carte. We service all of Seattle, as well as communities as far north as Edmonds, including Lake Forest Park, Shoreline, and Mountlake Terrace, and as far south as Burien. 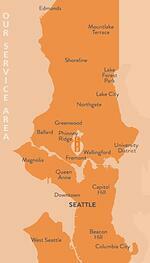 (Currently, we are not servicing the Eastside, but we do take on projects on Mercer Island.) We limit ourselves to this geographic area to keep our team on your project instead of stuck in traffic. We have also established a positive reputation with our local agencies, which helps make the permitting process go smoothly. Have you reviewed our pricing guides? All things being equal, most full-service remodeling companies in the Seattle area offer similar prices for similar services. If you are willing to sacrifice some level of quality, speed, or service, or take a more hands-on role in your remodel, you may be able to find a contractor to complete your project for less than the city's average. Conversely, there are certainly companies that charge a premium. After monitoring the local cost of remodeling for many years, we think you will find that our pricing comes in around the Seattle average. That said, the cost to remodel in Seattle can be a shock. Unfortunately, for quality work, you can expect to pay much more than what's shown on renovation shows on HGTV. Quality: At CRD, we have spent more than 35 years pioneering and perfecting the design-build model, all to ensure the quality of the work we produce and the overall client experience. Warranty: We stand behind our work with a 24-month warranty from the time the construction contract is signed, longer than the industry standard. Expert team: Labor is the single biggest expense in a construction project, especially in Seattle's tight employment market. We hire the best designers, project managers, carpenters, and office personnel. We treat our team exceptionally well and offer continuing education, healthcare, and a retirement savings plan. Longstanding subcontractor relationships: We value our relationships with our trades partners and have worked with some of them for more 30 years. Our subs are dedicated and motivated to arrive on time and do quality work. It's one of the many reasons we consistently meet our project timelines. Design center: Our Wallingford design center is a comfortable place to meet with your designer and make your design selections. We keep many samples on site so you don't have to run around town to shop for materials (unless you want to). Dedicated project managers: Unlike many general contractors, who are only on site occasionally, CRD assigns a dedicated lead carpenter/project manager to your project, who will be at your home every working day, ensuring that your project stays on schedule and is built according to plan. Dedicated estimator: Our production manager has decades of experience estimating project costs. You will have accurate and timely cost estimates throughout the design process and a fixed-price agreement before you start construction. Are you on a tight timeline? People often call us hoping to have their remodel completed within a few short months. We pride ourselves on the efficiency of our process and our dedication to meeting our clients' goals. However, there are certain factors that prevent large remodeling projects from being completed on a very condensed timeline without sacrificing quality. Permits: Certain smaller projects can be completed with a subject-to-field-inspection building permit, but many jobs require the city to do a full design review. If there are many projects in the city's queue, or your project requires complicated engineering, you may have to wait months to receive your permit. Documentation: At CRD, we believe that transparent pricing and a clearly defined scope of work help avoid misunderstandings and disagreements down the road. Our design-build process allows ample time to review design, materials selections, and pricing in detail before a construction contract is signed. Be wary of contractors who offer to speed up your project by starting construction with major questions left unanswered. Decisions: It's easy to underestimate the amount of time it takes to make the myriad decisions that go into a remodel. Using advanced 3-D modeling and physical samples, your project designer will guide you through the selection of flooring, paint, cabinets, floor plan, and the many other decisions you will encounter, but it is wise to leave enough planning time in your schedule to avoid decision fatigue. Waiting times: Like many remodelers in the area, we currently have a backlog of several months for design and construction work. Please contact us to find out when the next available opening for your project might be. If, after reviewing the above information, you think we might be a good fit for your needs, we would love to hear more about your project. We invite you to get the conversation started by sharing a few details about your remodeling plans via our online contact form. We look forward to hearing from you.